2004 Four Winns 268 Vista, Fresh water only boat is just the right size for a fun filled weekend getaway. All the toys are included. inside you will find a midcabin berth and a convertible dinette forward, plus a full galley with stove, fridge microwave, stereo cd with sirius radio,ac, The fully enclosed stand up head features a hot water showers and a porcelain head. The cockpit is complete with full camper canvas, a cockpit cover, table, carpet, removable cooler, walk thru windshield, tilt steering wheel, a huge plus, a screen cabin door. Up front is a windlass, remote spotlight and bow sunpads. She also boats a huge swim platform with transom shower dual stainless steel prop, dockside power, water and pumpout, fume and co detectors, halon system, dual batteries with switch and charger and a 1500w inverter. 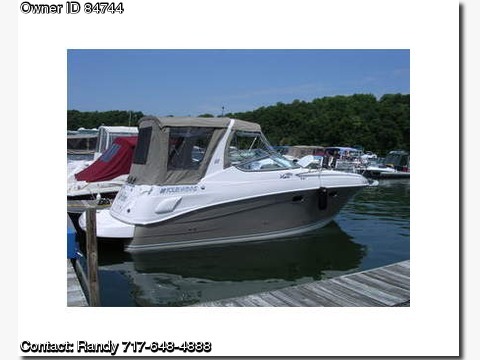 Includes paid 2008 Dock slip at raystown.